Environmentalism might sound like science to some, but Terry Tempest Williams said it takes a humanitarian perspective to fully understand it. 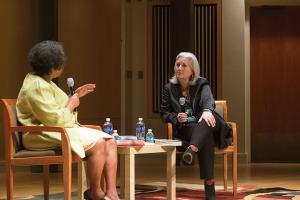 Williams, an award-winning nature writer, came to speak at the arts and humanities college’s Dean’s Lecture Series at the Clarice Smith Performing Arts Center on Thursday night to talk about the humanities, her writing and the environment. About 50 people attended the event featuring the environmental humanitarian, who is known for her books Finding Beauty In A Broken World and Refuge: An Unnatural History of Family and Place. She currently teaches at Dartmouth College. “I grew up with the value that community comes before individuals. I believe community is the vehicle for social change and the vehicle for empathy,” Williams said. The writer was born in 1955 and grew up in a Mormon family in Salt Lake City, Utah. She called herself “a free spirit in a conservative religion,” recounting events in her early life that led her to the path of writing and supporting environmental activism. The College of Arts and Humanities is accepting applications for the third cohort in its Social Innovation Scholars Program starting in spring 2015. Offered through its ARHU Center for Synergy, the program is an opportunity for students, regardless of major, to work closely with a faculty mentor and a non-profit organization to learn how to develop and implement a strategy for social innovation in a cause they care about. We are looking for students who are passionate, creative and talented enough to research and develop useful strategies. 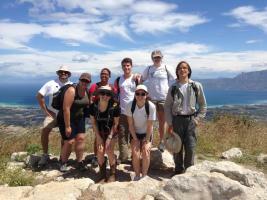 Each student works with a different organization in a customized program. Over the course of a calendar year, scholars research, design and implement their own innovative solution to the organization’s challenges. We will begin accepting and considering applications November 20 until December 8 or until filled. This program is open to all UM students, regardless of major. If interested, please email arichers@umd.edu by December 8 with your application form, essay, resume and nomination letter. Finalists will be interviewed. Space is limited so act fast! This is a great opportunity to work with a faculty member and build your resume! Please click here for the Call for Applications and for more information regarding the program. College Park residents and students at the city’s University of Maryland gathered Saturday to brainstorm a more pedestrian-friendly U.S. Route 1 – with music-filled gazebos, tree lined-sidewalks and a grocery store. The Think-A-Thon meeting at the College Park Community Center yielded outlines, sketches, lists and a lot of notes as about 60 people — among them university staff and elected officials — sat down to find creative solutions to the challenges of Route 1. In their discussions, attendees tried to address challenges such as too much traffic and a lack of independently-owned businesses, and tried to reimagine Route 1 as a space with more aesthetically-pleasing architecture, spaces for people to linger, art and music. The event, organized by the Center for Synergy at the university’s college of Arts & Humanities, is modeled on previous Think-A-Thons held in Baltimore. University and College Park community members will participate in an open discussion this Saturday titled Think-A-Thon, an event to promote infusion of the arts and culture into the planning process for revitalizing Baltimore Avenue. The venue is a “think and do type of event,” using the arts and culture to look for solutions to Route 1 obstacles, said Nicky Everette, the marketing and communications director for the College of Arts and Humanities. The discussion is hosted by the College of Arts and Humanities’ Center for Synergy at this university and will be held from 2 p.m. to 5:30 p.m. at the College Park Community Center and Youth Soccer Complex. For the past two years Think-A-Thons have occurred in Baltimore City to discuss the city’s challenges. However, this year Sheri Parks, research, interdisciplinary, scholarship and programming associate dean for the College of Arts and Humanities, said it was time to start a discussion in College Park about the future of Baltimore Avenue’s development. THE DEAN: Each fall, it is my privilege to provide an update on our accomplishments, announce new initiatives and share my perspective on the overall well-being of the college. Let me begin by saying, the state of the college is strong. Your vitality, creativity and sheer brilliance continue to chart new paths and gain national and international recognition. Your resourcefulness helps us find innovative ways to address our challenges. The college is strong because of you. Today, I assess our progress in relationship to the goals I outlined when I took this position three years ago. They are: advancing our common purpose, building community and promoting diversity and inclusion. I will also highlight a few of the many accomplishments featured in the forthcoming 2013-14 Year in Review. In some ways, advancing our common purpose is a grand challenge for the arts and humanities in a period when society conceptualizes grand challenges as broad issues in search of scientific and technological solutions. We know that scientific discoveries and technologies that change the world are ones that capture the imagination and interests of human cultures and societies. We also know that knowledge from the arts and humanities is key to understanding the meaning, implementation, utilization, and consequences of those scientific and technological discoveries. Our responsibility is to demonstrate that knowledge to others. In our college, “synergy” is the password. It’s the word that we use to symbolize the unique ability of the arts and humanities at Maryland to link humanistic ideas and creative traditions to modern innovation. In doing so, we provide an example for the campus and the community about the importance of the arts and humanities in addressing vexing problems confronting society and the world today. In January 2014, we launched the website for the Arts and Humanities Center for Synergy, the physical and virtual manifestation of a long desired and much discussed Humanities Center. 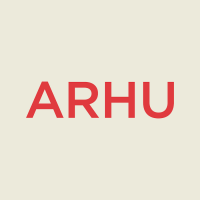 The purpose of ARHU Synergy is to provide a location for scholars, students, and the public to participate in multidisciplinary investigation and expression of the human condition. We do this by infusing the research and practice of the arts and humanities into new locations and areas of endeavor both inside and outside of the academy. The term “synergy” was chosen because it already resonates in disciplines across the university, referring to an interaction between two or more forces in which their combined effect is greater than the sum of their individual effects. Under the leadership of Associate Dean Sheri Parks, ARHU Synergy has introduced programs that promote and support the collaborative and interdisciplinary initiatives within the college, across the university, and with external professional and community partners; and research and scholarship in the arts and humanities. WORLDWISE: Arts and Humanities Dean’s Lecture Series, which this year features speakers on the environment, trauma and healing and innovation. Walter Isaacson, biographer of Steve Jobs and Albert Einstein, and President and CEO of the Aspen Institute will launch the series in November. On October 11, ARHU Synergy will lead a Think-A-Thon in College Park that will bring university administrators, city officials and residents together to envision the impact arts and culture can have on plans to reinvigorate Baltimore Avenue and revitalize the City of College Park. Last year we began a partnership with the American Academy of Arts and Sciences to promote a dialogue on the importance of the humanities to the future of our nation as discussed in their report and video “The Heart of the Matter.” We brought to campus commission members John Lithgow, Annette Gordon-Reed and later Stephen Kidd, director of the National Humanities Alliance. ARHU has been credited by the Academy as being one of three national leaders in advancing the conversation about this important report. Community engagement in scholarship and teaching has been a key mechanism for linking humanities and arts to social issues and underserved populations. Last year we launched the first year of a three-year pilot program called the Foxworth Creative Enterprise Initiative. Today, I share a short clip of the Foxworth promotional video highlighting Professor Leigh Wilson Smiley's students’ work with the Latin American Youth Center in Hyattsville. Later this week I will release the full video and you will receive an announcement for the next round of faculty applications to teach Foxworth courses. The other major focus of ARHU Synergy—facilitating research in the college—is already having an impact. ARHU Synergy has provided workshops and training for 110 faculty on the fundamentals of grant writing, budgeting and fellowships. In fiscal year ‘14, our faculty submitted 30% more research proposals than in the previous year and more than doubled the amount of money requested. It’s too early yet to know the results of these requests, but we’re optimistic that this increased activity will yield greater reward. One of our most celebrated accomplishments with research support was with the Department of Classics, which successfully competed to become the sole recipient of a half-million dollar grant from the National Italian American Foundation. That grant is for new research on the legacy of ancient Rome as reflected in the architecture and art of the United States’ capital and in the nation’s system of governance. Please visit the website www.arhusynergy.umd.edu to get informed and involved. Also, be on the lookout for a forthcoming collaborative virtual workspace that will facilitate the formation of research groups around multidisciplinary topics of interest. Advocacy for the arts and humanities takes many forms. In late summer, the possibility of a campus partnership with the Corcoran Gallery of Art and College of Art + Design was laid to rest. I am convinced that the discussions generated on campus and in the local art community have been beneficial. First, they led to new ideas and conversations about academic programs and artistic engagements that could benefit the entire campus. Second, they have enhanced campus commitment to foundational principles about the role of the arts in our university. Among these principles are that the arts and humanities are a core component of a quality education, a gateway to cultural understanding and conflict resolution, and can enhance and refine the entrepreneurial abilities and creative talents that today’s students bring to college. In an effort to capitalize on the energy and insights generated through this process, I have been working with others to propose and develop ideas that will help President Loh achieve his vision for the arts at Maryland. Our ideas include a campus based institute for art and design innovation; a program in digital media studies; and the integration of arts and culture into the revitalization of College Park. First, we are collaborating with the University Career Center to house Kate Juhl, Program Director, in the college’s Office of Student Affairs four days a week. This will help us bring career advising and engagement to our students in a much more direct manner. Second, we are launching a first-year seminar for ARHU majors designed to empower and acclimate them as they transition into the university. It introduces them to different methods of humanistic study and explores how multiple disciplinary perspectives can be used richly and critically to understand human beings, cultures and societies. The call for proposals went out this week. Whether working in interdisciplinary partnerships, as independent scholars or supporting the work of the campus in other ways, our faculty and staff continue to garner prestigious national awards as well as important campus recognitions. While you can learn about these in greater detail on the ARHU website or in the forthcoming Year in Review, I would like to acknowledge a few of them today. National awards announced in the past year include a Guggenheim to Holly Brewer, Harvard University’s W.E.B. Dubois Medal to Ira Berlin and a Korean Government Precious Crown Medal of the Order of Cultural Merit to Robert Ramsey. Faculty members have received numerous book awards and students in or affiliated with ARHU have won a Fulbright, 12 Borens and nine Critical Language Scholarships for the current academic year. Campus level awards that deserve special recognition are: Jeffrey Herf, Distinguished University Professor, Jonathan Auerbach Distinguished Scholar-Teacher and Linda Mabbs, the Kirwan Faculty Research and Scholarship Prize. These three colleagues will be honored at the university convocation on October 7th. Marilee Lindemann, recently appointed executive director of College Park Scholars, received the Freedom and Liberation Medal from the President’s Commission on LGBT Issues; and Jessica Enoch, Jason Rudy and Lynn Bolles received Graduate Faculty Mentor of the Year Awards. Jessica White in the college’s Office of Student Affairs won the 2013-14 Provost Professional Academic Advisor of the Year Award, and Philosophy advisor Christopher Vogel won the 2013-14 Provost Graduate Advisor of the Year award. There are numerous other outstanding accomplishments and I invite you to join me in celebrating all of our colleagues and students who have earned special recognition. Our faculty are pivotal in our efforts to advance our common purpose and you have just been introduced to our 15 newest faculty members. As you can see from their bios in the program, we continue to attract to our campus people with stellar accomplishments and exceptional promise. So, I will repeat what I said last year: “The responsibility of those of us who are seasoned members of this community is to provide the resources, intellectual climate and mentoring that will permit the talents of our new faculty to bloom and encourage them to remain rooted in University of Maryland soil.” This is one of the most important aspects in the second goal of building community. We also seek to build community by supporting staff through the formation of a staff council. That council is now in its second year of operation and it has been officially incorporated into the College Plan of Organization. Its chair, Claire Goebler from SLLC, sits on the Collegiate Council. This year the staff council is planning a variety of events including helping staff with the annual review (PRD) process, professional development, healthy workplace activities and community service. Salary compression has been an important concern that has had a corrosive effect on faculty and staff morale. Over the last two years, we have found ways to begin to address this issue through strategic use of the merit pool. This has been a collaboration between individual units and the Office of the Dean and it is one that we will strive to continue. Nevertheless, resource issues deriving from a structural deficit at the campus level continue to result in budget cuts. It is also now clear that some proposed faculty and staff hires must be reconsidered. The move to the Big 10 heightens awareness of our funding limitations as compared with our peers, yet it also provides a springboard for rethinking resource allocation to promote strategic growth in the future. Both President Loh and Provost Rankin have expressed their full commitment to this rethinking as a means to support excellence at College Park. College priorities and actions for diversity and inclusion are described in the Diversity Task Force Report and College Implementation Plan, distributed in fall 2013. When you review it—which I hope you will do regularly—please note that we affirm that work on diversity and inclusion takes place in our classrooms, hiring and promotions, scholarship, and community engagement. As we commit ourselves to fairness and equity, we embrace the unique position of arts and humanities disciplines in advancing scholarship, creativity, and teaching about identity and difference. This fall, I take special note of seven hires across the fields of LGBT, African American, and US Latino/a studies. These hires diversify the faculty and bring diversity and inclusive scholarship to the core curriculum across the college, with notable gains in American Studies, English, History, the School of Languages, Literatures, and Cultures, and Women’s Studies. Moreover, our 100% success in promotion and tenure cases this past year moves the college faculty closer to gender parity in the tenured ranks, simultaneously advancing expertise in fields led by women scholars. Finally, the participation of ARHU faculty in the National Science Foundation (NSF)—funded ADVANCE program has helped women and faculty of color build support networks among peers and mentors, receive seed grants for collaborative research, and has extended the sensibilities of work-life balance and the rights of family and medical leave to all faculty, including those in the professional tracks. I commend Laura Rosenthal, who will serve as ADVANCE professor for a second year. She will continue the important work she has begun in engaging full professors as mentors for associate and assistant professors. This afternoon I’ve presented only a snippet of the dynamic activities of the college. I hope it helps you understand why I conclude that the state of the college is strong, even in the face of societal and financial challenges; why I am optimistic about our future; and why I consider it a privilege, honor, and a joy to serve as chief advocate and executive officer for University of Maryland’s College of Arts and Humanities. Thanks to the staff who have worked so hard to plan this event and insure that it runs smoothly—the entire staff of the dean’s office makes everything I discuss possible every day. I particularly want to acknowledge Brian for the video, Nicky for all of her work in telling our story, Chanel for being a rock even when it gets crazy and Veronica for being a Rockette. Now I have one final slide and remark. COLLEGE PARK, Md.—Imagine a street with a world-class art gallery and movie theater, where visitors and local residents stroll, shop and dine at sidewalk cafes alongside students and artists. Now, imagine that street is Baltimore Avenue—also known as Route 1—College Park’s major artery connecting residents, business owners, workers and the students, faculty and staff at the University of Maryland. As the university and city consider plans to reinvigorate Baltimore Avenue, the College of Arts and Humanities’ Center for Synergy is asking the community to rethink the area and to imagine the impact arts and culture can play on its revitalization. The center plans to convene the greater College Park community for a Think-A-Thon planned for October 11. It recognizes that the university is a major anchor institution in College Park and Prince George’s County. This supports the vision of turning College Park into a top 20 college town by 2020. The event is intended to help university administrators, College Park officials and other city stakeholders, including residents, artists and students, gather information for a future redesign during an afternoon brainstorming session. All are invited to share ideas about how art and culture can address community challenges and help turn College Park into a national destination for living, learning and arts. "The Think-A-Thon is another reason that College Park is a smart place to live," said City of College Park Mayor Andrew Fellows. "We've always been thoughtful—now we've begun to do so collectively, by creative and collaborative design." Actively engaging the community as a stakeholder gives the regional redesign a holistic approach, said Center for Synergy Director Sheri Parks. The center is leading the university’s conversation as it relates to the infusion of arts and culture in a redesign, and seeks to engage community input in a series of pre-Think-A-Thon events leading up to the larger event. Omar Blaik, CEO and founder of Philadelphia-based U3 Ventures, plans to attend the session to listen and learn what community members want. Blaik is an experienced consultant who helped transform swaths of Philadelphia around the University of Pennsylvania. He is now working with the University of Maryland in the larger East Campus redesign project with the goal of turning College Park into a vibrant campus that is integrated with its community through retail, dining, business, arts and culture. The College Park Think-A-Thon is scheduled Oct. 11 from 2 to 5:30 p.m. at the College Park Community Center, 5051 Pierce Avenue, College Park, MD 20740. For more information or to register, visit www.arhu.umd.edu/thinkathon. Media interested in attending the event are asked to contact Nicky Everette at 301.405.6714 or meve@umd.edu.